Provides storage for diesel, fuel and similar products with 7 liquid tanks with 38.000 m3 liquid tank capacity in its own tank terminal, as well as distribution with its truck filling station. 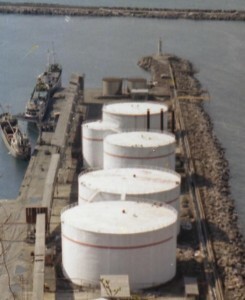 White Products (diesel and unleaded fuel) and Black Products (fuel oil) are stored in product storage terminal. 4 independent product circuits are available in the tank terminal being 6’’,8’’,10’’, and 12’’.Land tankers are serviced with 7 filling arms in 3 separate filling islands. Moreover, it is possible to discharge and store all kinds of industrial oils, raw sunflower seed oil, etc.